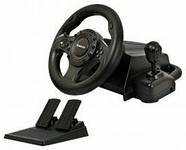 Defender Forsage Drift GT is the model of a modern wire wheel for PC and PS3 and PS2. Has a pleasant classic design, and pleasant to the touch, though braid steering of rubber. This game steering wheel has also transmission, gas and brake pedals. Wheel diameter is 24.5 cm, with the rotation angle of 270 degrees. Interesting feature of the vibration of bestowal, allows you to feel the full realism in gaming simulations. He also has 12 buttons and a directional pad (D-pad. And four switch the camera angle.